Every company looks for ways to decrease costs and increase productivity, right? If you are the one responsible for your company's growth, then you really don't have the time to sit and look through the time spent on every single task. Time cards and punch clocks used to be the most efficient tools for managing employee time. But if you have a business comprised of people working across the country (or world), having employees punch in and out the traditional way makes no sense. So what’s your strategy for employee time tracking on projects? Are you frequently sending emails back and forth, or using cloud based sites to store documents and start message threads? The great solution is an employee time tracking app. Whether you just want your remote employees to be able to track their time, or need to track the time employees spend on specific projects, you’ll find that a time tracking app is a great help to you in managing your employees’ time. There are a variety of time tracking apps available today targeted at businesses and professionals for tracking amount of time spent on a particular project, so they can bill their clients accordingly. 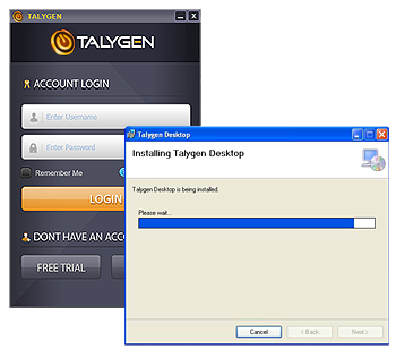 If you’re looking for an option that is user-friendly and easy for the employees to use, then take a look at Talygen. Talygen is attractive and packs a good feature set. The Talygen iphone and android apps are extensions of Talygen web app. The app works like a time clock and members can manually enter the time they spent on a specific project or use a stopwatch feature. All tracked hours on the app are automatically synced with the web app. You can compile a report for each team member project wise. Another great feature of Talygen is the ability to download real-time performance charts that show where time went and what portion of it was billable. Talygen also allows you to plan tasks ahead and send reports to clients with your logo. If you are on the lookout for a web-based time tracker tool, give the free trial a shot. Since the only way to really evaluate a time tracker service is to actually use it. With what you have learned here so far, it is clear that employee time tracking system really takes much of the monitoring out of your hands. You can see that a lot of your employee monitoring time (and, in turn, cost) can be eliminated with a time tracker. You can then focus more on getting your business up and running rather than monitoring your team and trying to figure out where their time went.